Armand Jakobsson, best known as DJ Seinfeld. Has releases on respected labels such as Meda Fury, Ectotherm, UN.T.O and Lobster Fury. DJ Seinfeld’s beats are ultimately guided by an idea of authenticity, true to the spirit of the early house pioneers and the unabashed rawness that the confines of their equipment demanded. A lot’s been made of this lo-fi fuzz, with many clamouring to declare it a scene, but he won’t be put into a box. Footage of his gigs or their post-show reaction exemplifies the reception Seinfeld gets as a DJ. Biographies often claim a DJ regularly ‘sends crowds into rapture’ or ‘lays waste to the floor,’ but in DJ Seinfeld’s case pandemonium is the default. Mixes show his depth control of build-up and feel in the booth. The point of no return though, came after one evening spent with Ableton and a few beers. The track ‘U’ was uploaded to Soundcloud, and the internet went into overdrive with the hit!! 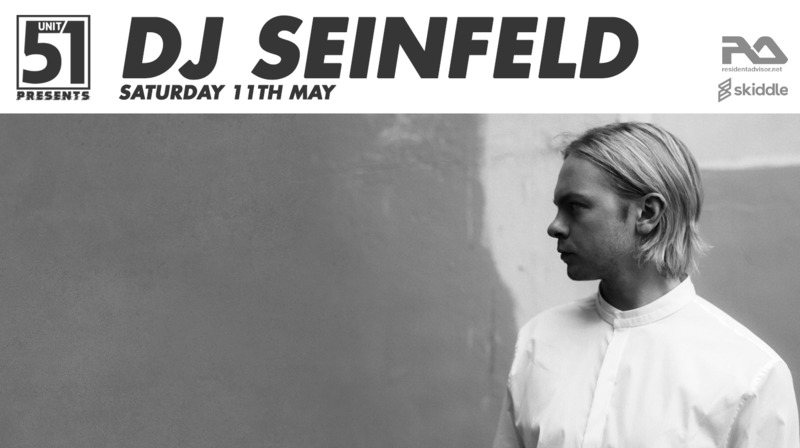 It’s safe to say we cannot wait for DJ Seinfeld to grace us with his presence at Unit 51.